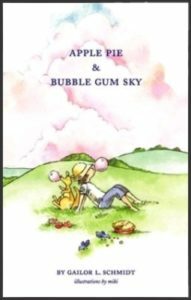 Apple Pie and Bubble Gum Sky by Gailor L. Schmidt is an enchanting collection of poems written from a grandmother’s perspective to amuse young readers. The poems are based on the unexpected and delightful things children say and do. Grandparents and parents reading the book with children may find that it inspires a few memories of their own.